I started riding Whited Trails because i was tired of the partying which seemed to occur daily at carmalt trails way back in high school. 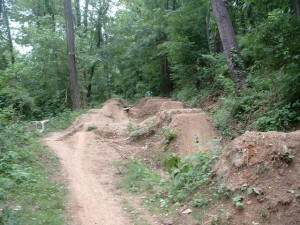 I am not sure who started these trails, i think it was Matt Furray, Louie, and Jerry. I could be wrong, but who cares. When i got there, the trails consisted of a tight mini 6 pack, which led to a set of quads (the racetracks and the trick doubles). There was also another set of small quads to the left and down a little further on the left, and a jump with a tree fallen over it. After a while a 3rd set was added after the trick doubles but was always wet. The jump with a tree across it was built up much bigger and the tree removed. the day we finished this, my brother luke ended his bmx career on this jump by taking the handlebars into the stomach, lacerating his spleen, as his front tire hit the backside of this landing. The entire Brookline and Mt Washington bmx crew died within a year or so after this. We managed to still go down there every now and then after that and hit what remained. But upon davey starting to ride, joe started building a rhythm section there for davey to learn on. A lil work from everyone and we had some decent trails. After that, due to the limitation of what we could do at Louisiana, Joe and Dustin started getting a little wild with our imaginations and started building it in a strange style. Short gaps with tall lips and tight to boot. The pack mentioned before is now 12 pack, which is now called the PBR’s due to how much PBR was consumed when making this section. After that, there is a burm which is about 180 degrees to what me and joe are calling the Dead Guys. We started these last year, but they are not complete. The section is supposed to take us all the way back to the starting point. The first set has a gap of well over 15′ or so it feels. we havent been able to clear it yet, but we need to add some more height to the burm to achieve max speed around it comfortably. When we start working on the Dead Guys, we will be drinking cases of Rogue Dead Guy Ale like its going out of style. Hopefully within the next two rainy days, everything up to the burm will be complete and we can start working on the Dead Guys.